Today I had a 16 mile long run. I did the best I could. I chased John Z. and Belle. A few miles into it I had a bathroom break yet I was able to catch up to them on Lamar. We ran part of the marathon course especially the series of hills starting around mile 9. I stayed nearby John and Belle until the last few miles. Then I just couldn’t keep up and had to slow down – I was so stiff and sore. I only had one Clif-Shot about one hour into the run – maybe that affected me. After a while my left hamstring and ankle were causing problems again. However I ran the whole way with no significant walking. I did lop off some of the course to make it a bit shorter keeping it to about 16 miles since it was initially 16.7 mile – thus making it easier on myself. I finished in 2:42 – about 10 minutes per mile. Afterwards I did my foot exercises and stretched. Then headed home. This weekend we were to run 10 miles “on your own” (OYO). Coach Karen however set up an unofficial group run this morning at 7 AM. I followed a group of four women most of the way. They were my pacers and map readers. John Z. who is hurt manned the one water stop on Exposition. The first two miles were on the Town Lake trail, the next miles were on the upcoming marathon course. I counted 7 hills though the marathon section. At 35th street we turned around and headed back downtown. Based upon our map I completed about 11 miles in about 2 hours. For the last few miles my left hamstring was giving me problems. It was making it difficult to run up hills – the muscle was tight and sensitive. Afterwards it’s now aching and throbbing. My heart rate monitor was again not working even though it has a new battery. I finished the run, but I can’t say it was fun or easy even though this is a recovery week and it should have felt that way. We had to do 18 miles this weekend (someone said afterward it was more like 19). It was to be a comfortable run, but 18 is still a long long way. The weather was warm with us starting out in the mid 60s. My ankle was bothering me most of the time and I tried to ignore it, but it finally took its toll causing me to slow down. I pretty much ran by myself. We left downtown and ran north to Ladera Norte which is a very hilly road, but just as we got there our course map skipped the hill and had us return to downtown. So although the course was called Ladera Norte, we didn’t really run that particular part. During the first half or so I tried to catch Belle and John Z., however at about 12 I just let them leave me behind since I had to go slower than them. At one stop Coach Karen asked how my ankle was and all I could do was laugh and say I’m making due. Near the end I forced myself to run the entire thing and I finished in 3:14. Afterward several others said that it had been a tough run. In the Annex I did my foot exercises and stretched my legs, but they were quite tight and throbbing. When I got home I sat in a cold water tub with all the ice cubes from the refrigerator for 20 minutes. I sipped on hot choloclate to keep my inner core warm as I read a magazine to kill the time. Then I took a hot shower. Overall I’m not damaged, but these past two weeks have been a challenge. My left hamstring is aching. For the past few weeks my heart rate monitor needed a new battery so there hasn’t been any graphs, but this week I finally got one and here is my heart rate. I was to do an easy 4 miles this morning. I woke up late since I’m on vacation. I only realized that I was supposed to run at about 9 AM. Also after yesterday’s hill workout I was stiff. So this morning only 12 hours later I ran, but I felt so sluggish. I just couldn’t catch my breath. The 4 miles seemed to take so long to complete. I forced myself to get it done. It was a hard 4 miles. Our long run today followed the AT&T Austin Marathon course. It was a LAB (as in laboratory) run so we were to try to run it as if we were really doing the marathon, and not as an easy long run. We were to start at mile 9 and run to the end (mile 26.2). We were to complete 18 miles including about a mile extension at the end to get back to the RunTex building. I was thinking of running with the 4:30 group, but started with the 4:15 group. Dan-O was the pace leader who I know. The first three miles were a warm up (in 38:08 – I started my timer too early before we really started running so this time is inaccurate). The next four sets of 3 miles were to be done at MGP with a 1-3 minute break between each. The final 3 miles were to be a cooldown. Well I started with the 4:15 group, but at the second water break (in 28:04 for miles 3-6) I just couldn’t stand around waiting, so I took off and chased the 4:00 group and caught them (in 27:56 for miles 6-9). The pace leaders were running too fast (8:30/M), but I tried to keep up with them for that first section (in 26:51 for miles 9-12). Remember these times include 1-3 minutes of resting at each water stop. We were really running. However, the next one I began to slow down (in 29:20 for mile 12-15). After these two faster sections with this crowd I finally decided to take it easy and really cool down for the last 3 miles back to RunTex (in 30:58 for miles 15-18). I was getting really stiff near the end. After it was all over I don’t remember much of the course unfortunately except that there were a few hills that will be tough come next February. Last year I pushed real hard. This year I’m taking it easy. What surprises me is how hard it is regardless. In Chicago I took my time and I still had troubles. My muscles still got tight. I still ached afterwards. My ankle still burned. However my heart rate was less. My stomach was less upset. I wasn’t panting trying to catch my breath. So I feel somewhat better physically going slower, but mentally I’m sad that I can’t keep up with what I did in the past and that I can’t go faster. Nevertheless I need to accept myself as I am – faster, slower, or in-between. That’s the tough part. Today was a race that wasn’t a race. It was a long run. I just didn’t feel like racing and I had the option of doing it as a long run. It was cold out this morning and a bit windy with gusts of 10 MPH. When I arrived I met my running buddy Barb E., and when the race started I saw her and decided that it would be like old times to spend the time together, chat, and have a merry old time, and, you know what, we did. The miles flew by because we were talking about ourselves, our families, our work, and our running. Along the way we spent time talking to Elizabeth too. Barb and I stuck together through it all and I finished in 2:17:33 (or 11:11/M) and Barb in 2:17:37. Although we crossed together the skew was due to us starting in the crowd at different times. At the end Ed B. was at the finish line (he was helping with the race today) and wrapped up Barb in a metallic mylar sheet and presented me with a FILA cap. Thanks Ed! Overall it was a lot of fun talking and chatting, although I’m still tired from the early morning wakeup and my legs and knees ache a bit from the distance. At least I’m out there doing it at whatever speed I go. 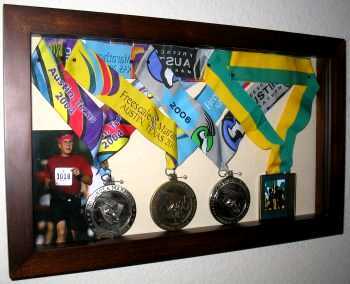 Last Christmas Kathy gave me a shadow box for my running medals. It has sat on my desk for almost a year and today I did something about it. I put my four marathon medals in it and hung it on the wall above my desk. I think it looks quite nice, and I think I’d like to do more for some of the other medals that I’ve gotten over the past few years of running. In order left to right, 2004 Austin Marathon, 2005 Austin Marathon, 2006 Austin Marathon, and 2006 Chicago Marathon.